OXFORD, Miss. 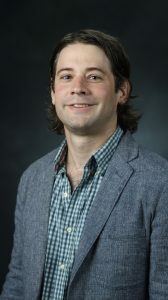 – Cole Stevens, a faculty member in the University of Mississippi School of Pharmacy has been awarded a grant from the National Cancer Institute for cancer prevention research using natural products. “Developing bacterial platforms capable of producing polyketides with anticancer activities will allow us to thoroughly evaluate their potential as therapeutics,” Cole said. Once Stevens has produced sufficient amounts of the gephyronic acid, a research group led by Kristie Willett, chair of biomolecular sciences and professor of pharmacology, will test zebrafish grafted with human breast cancer cells to determine if any anticancer activities are present.